Airborne gamma-ray surveys (GRS) have been routinely applied for decades to map the earth’s surface. Recent advancements in computing power and detection technology have significantly improved and it is now possible for gamma-ray systems to be manufactured more compactly, rugged and light-weight. These next generation gamma ray spectrometers open boundless opportunities to use these systems in a way never done before, as on the frame of a TEM system. 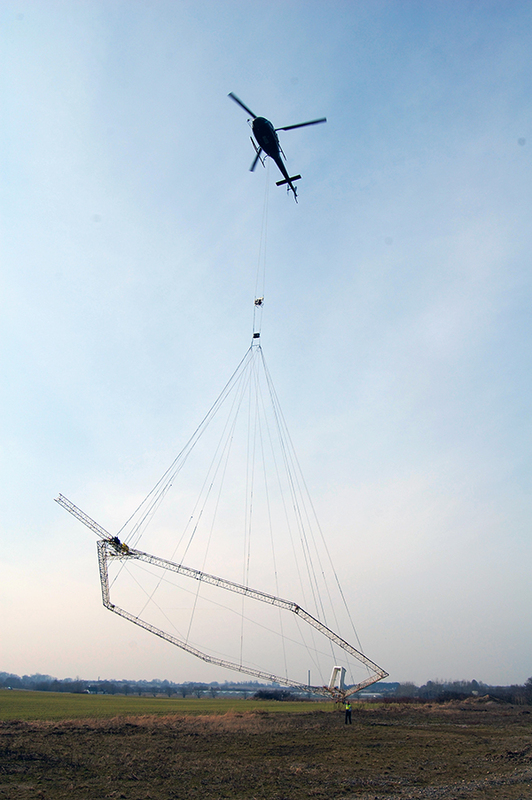 SkyTEM is a helicopter-borne dual-moment time-domain electromagnetic (TDEM) system employed globally for resource exploration and environmental and geotechnical studies. Initially designed to acquire electromagnetic data, the system was upgraded in 2008 to include an option for the acquisition of total field magnetic data. A further upgrade in 2010 allowed for the acquisition of gamma-ray spectrometry (GRS) data as well. All geophysical sensors (TDEM receiver coils, magnetometer and gamma-ray spectrometer) are mounted on the rigid carrier frame providing the unique capability to acquire simultaneously all geophysical data (EM+MAG+GRS) as close to the ground as safe flying allows. This low flying gives the advantage of increased resolution and better efficiency. The SkyTEM system is an excellent example showing how the size and weight of the 4L Medusa system (MS-4000) permits seamless installation on the SkyTEM carrier frame. Medusa Sensing helped SkyTem to mount a gamma-ray spectrometer on their TEM frame. Part of our service was an extensive testing program to show that our sensors are not influenced by the TEM measurements. The key advantage of using lightweight spectrometers is in the system integration. The SkyTEM system is an excellent example showing how the size and weight of the 4L Medusa system (MS-4000) permits seamless installation on the SkyTEM carrier frame (such as SkyTEM101, SkyTEM304, SkyTEM508) that would be almost impossible with a heavy and fragile standard crystal pack. This installation brings the spectrometer 30-50 m closer to the ground during surveying as opposed to the conventional installation on board the helicopter. Located much closer to the earth’s surface, the frame-mounted GRS system absorbs much more energy from the ground and does not suffer from the gamma-rays being absorbed in the air. Lowering the terrain clearance of the spectrometer by 30m increases the count rate about 40%. By this integration of systems, data acquired for ground water mapping, can also be utilized for detailed soil mapping and mineral exploration. See paper on our wiki.